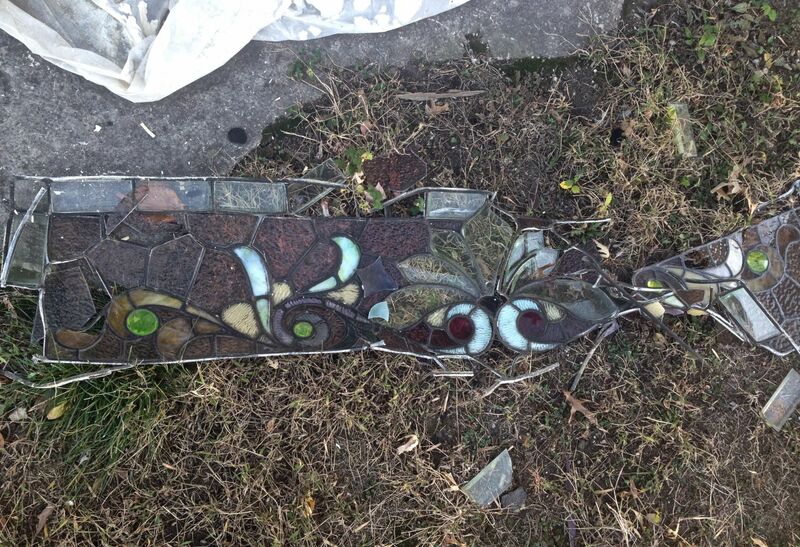 Last November I did a post about a suicidal stained-glass window in the Cross House, which had leapt to its death, and landed on the ground is a crumpled, shocking, and sickening heap. 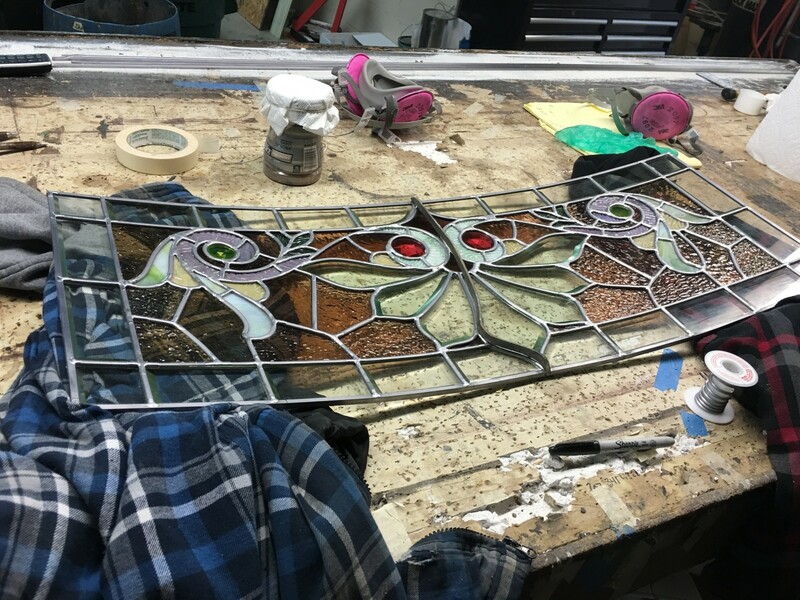 Today, I received two images from Scott Hoefer, who is restoring many of the stained-glass windows in the Cross House, as part of the Heritage Grant. THE window. Fascinating! And…reborn! This brings a tear to my eye. The window is curved, and is part of the turret. 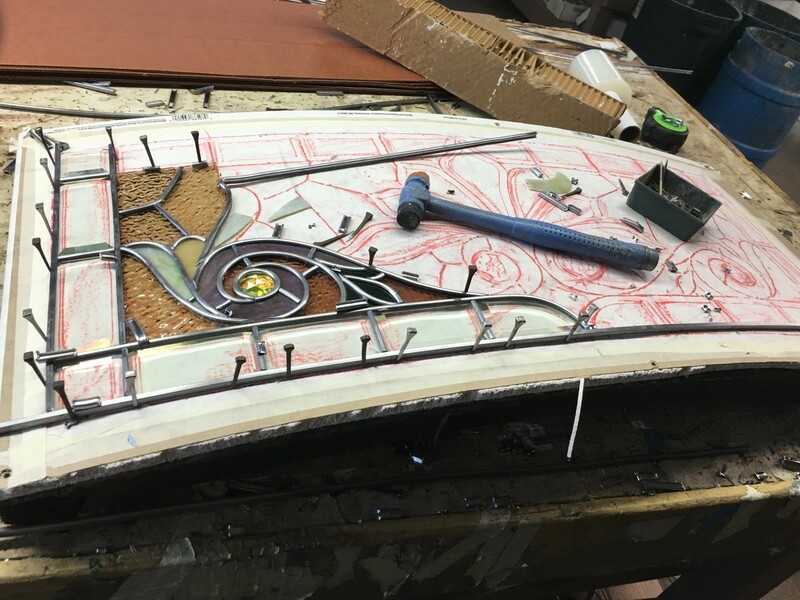 The outer edge of clear panels is all beveled, as is the center flourish. Amazingly, only a few glass pieces broke in the tragic fall. Most of what you see is original. Amazing. Next week Scott stated I can pick up the panel, and its two adjacent panels. Hallelujah! UPDATE: After doing this post I realized that the suicidal window is NOT the reborn window pictured above. The reborn window is one of the two adjacent windows! Such craftsmanship. Such beauty ! ! I’m curious (it’s a curse, I swear) Could you ask Scott if he uses what appears to be horseshoe nails to hold the frame for a reason, or because he just happens to have them? I’m hypothesizing he uses them due to their curved point, which allows him to put a bit more pressure inward on the frame, as horseshoe nails are meant to curve, allowing a better “clinch” when seating the shoes. It also helps prevent “quicking” the horse. Well with 42 stained glass beauties to deal with, you’re bound to get them confused. Maybe if you named them all…? I don’t know if it was originally done that way or not, but I REALLY like how he’s cubes the stiffening rib across the center. Even though many original historic Windows have straight stiffening ribs across the pattern of the glass, the extra touch of hiding it on a pattern line is the kind of little detail that really makes it fantastic. There’s a limit to what can be done, of course, because the more of a curve you need, the more flexible and weak the reinforcing bar becomes. I haven’t had to use reinforcing bars in any of the leaded glass windows I’ve built, but if I were, I would make an effort to design my pattern with the need for reinforcing bars in mind. I wonder if any original glass artists considered that?